This book is a campaign memoir of Huckabee's 2008 Presidential race. It's lighter on policy than Huckabee's other books (listed below) and much heavier on the internal politics of presidential primaries. In Huckabee's view, the 2008 GOP primary came down to McCain vs. Huckabee at the end. Technically, that's true, because Huckabee was the last candidate to withdraw, which in his view made him one of the "last two candidates left standing." In fact, several other candidates had more delegates than Huckabee at the time they withdrew, but dropped out when McCain's lead became insurmountable. When asked how he could overcome the mathematical impossibility of garnering enough delegates late in the primary, Huckabee famously claimed. "I didn't major in math; I majored in miracles." And Huckabee further claimed to have a second constituency that might be called disgruntled voters -- those tired of the corruption and lying of the Bush years, or tired of the disingenuous standard answers of mainstream politicians. That constituency was perhaps best epitomized by Huckabee's frequent popular appearances on late-night TV shows like The Colbert Report and Saturday Night Live, both of which appeal to younger and more liberal audiences. I am a regular viewer of both programs, and the audiences' enthusiastic support of Huckabee seemed sincere to me -- and mostly on the grounds that Huckabee claimed. Viewing myself as a member of Huckabee's second constituency, you can read my enthusiastic support in this vein in my review of Huckabee's earlier books. However, while I was enthusiastic about Huckabee's candidacy in 2008, there is little chance I would ever vote for him! In summary, I agree with the premise of this book, that Huckabee's candidacy was good for America and good for politics because Huckabee is a sincere and fresh voice amid stale politicians. He is as unabashed about his Christian conservatism as Howard Dean was about his secular progressivism. 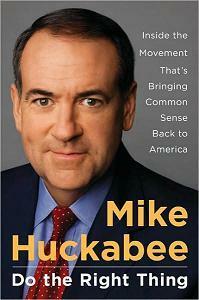 The political purpose of this book is pretty obvious -- I hope it serves as a precursor to a Huckabee re-run in 2012. Mike Huckabee: I am actively PRO-LIFE not just quietly pro-life. Mike Huckabee: Unborn Child Amendment: all legally possible to protect life. Mike Huckabee: Culture of life encompasses more than just abortion issue. Mike Huckabee: Pro-stem cell research but not embryonic stem cells. Mike Huckabee: No state-by-state decisions on moral issues like abortion. Mike Huckabee: In AR, instituted "Choose Life" license plates. Mike Huckabee: 2007 economy ok for the rich; but working class struggled. Mitt Romney: 2007: Help economy by investing in high-yield stocks. Mike Huckabee: Pays attention to black vote; got 48% as governor. Mike Huckabee: Regulations burden small business more than large companies. Mike Huckabee: Corporate taxes are stupid; they just get embedded in prices. Ralph Nader: 1960s seatbelt laws represented a cultural change. Mike Huckabee: Differentiates microevolution from macroevolution. Mike Huckabee: Courted home-schoolers in Iowa caucus. Mike Huckabee: Ivy League founded by spiritual people for Christian purpose. Mike Huckabee: In AR, instituted charter schools & abstinence education. Mike Huckabee: Develop both sides of students' brains: music AND math. Mike Huckabee: Oil has not just shaped our foreign policy; it's deformed it. Mike Huckabee: Hunters are some of our most dedicated environmentalists. Mike Huckabee: 2006: Smoke-free workplace across all of Arkansas. Mike Huckabee: Supports traditional marriage and covenant marriage. Mike Huckabee: In AR, issued Family Protection Policy Directive. Mike Huckabee: Free AND fair trade: globalize, but help those whom it harms. Mike Huckabee: Diplomacy hasn't worked; impose sanctions on China. Mike Huckabee: Self-government by Golden Rule is ideal best. Mike Huckabee: Shelves of law books means absence of moral behavior. Mike Huckabee: Roach Motel: DC supposedly place to serve, not to be served. Mike Huckabee: Red tape increases more than taxes--but costs just as much. Mike Huckabee: Elections by E-Bay? Media focuses on money over ideas. Mike Huckabee: Raise donor limit to largest self-donation, even if $5M. Mitt Romney: 2002: My positions won't make me the hero of the NRA. Rudy Giuliani: As mayor, suggested federal gun licensing. John Edwards: Health Markets, over time, evolve toward single-payer. John McCain: Healthcare reform requires cultural change over a generation. Mark Warner: Proposed 50-governor 7-principle Medicaid reform. Mike Huckabee: Proposed 50-governor 7-principle Medicaid reform. Mike Huckabee: Quit treating snakebites and start killing some snakes. Mike Huckabee: Healthcare reform requires cultural change over a generation. Mike Huckabee: First-dollar coverage for all expenses defies common sense. Gary Bauer: Shifted focus from traditional family to national security. George W. Bush: 2002 USA Freedom Corps included Peace Corps & AmeriCorps. Mike Huckabee: Islamo-fascists hate us & want to destroy our way of life. Mike Huckabee: Fight terror with CIA and small quick strikes. Mike Huckabee: No draft, but mandatory one-year civilian service by age 26. Mike Huckabee: 3 million jobs left since 2001, but not due to trade. Mike Huckabee: Continue farm subsidies for low prices & competitiveness. Bill Clinton: GOP lost when they put faith voter out of way in '92 & '96. George W. Bush: OpEd: Disappointed values voters by focusing on non-values. John McCain: OpEd: Sought Christian endorsements, then rejected them. Mike Huckabee: Underdog victory in IA caucus propelled campaign to top tier. Mike Huckabee: GOP puts faith in individual; Dems put faith in government. Mike Huckabee: Do The Right Thing to change America's future. Mike Huckabee: Everyone deciding what's right & wrong is stupid. Mike Huckabee: Faith voters flocked to me because GOP left them. Mike Huckabee: Press misunderstands: support comes from non-religious to. Mike Huckabee: The Huckaboom: consensus candidate among Values Voters. Mike Huckabee: TV ad with Xmas cross was ad-libbed & completely accidental. Mike Huckabee: Faux-cons (false conservatives) include libertarians. Mike Huckabee: TV ad "Chuck Norris Approved" became Internet phenomenon. Mike Huckabee: Vertical solutions, not horizontal right-left nonsense. Ron Paul: OpEd: Genuine convictions, no matter the audience. Ron Paul: OpEd: Faux-con libertarians like Paul worship Ayn Rand. Ronald Reagan: Picked up Goldwater's mantle after 16 years. Ronald Reagan: 1979: Endorsed faith voters & activated movement. Ronald Reagan: "City on a Hill" cites Jesus' Sermon on the Mount. Ronald Reagan: 1983: With Tip O'Neill, implemented Greenspan Commission. Mike Huckabee: In AR, eliminated marriage penalty & bracket creep. Mike Huckabee: Tax system can't be fixed, not even with Duct Tape & WD-40. Mitt Romney: Raised MA taxes by 5%, via $700M in fees. Mike Huckabee: Viral campaign website spawned Huck's Army of bloggers. Eric Shinseki: OpEd: Calling for 300,000 in Iraq applies Powell Doctrine. Mike Huckabee: Apply Powell Doctrine to Iraq: overwhelming force. Mike Huckabee: Shift federal social programs to church, family, & community. Mike Huckabee: In AR, banned video poker & assisted suicide. The above quotations are from Do the Right Thing, by Mike Huckabee.